Philando Castile. Alton Sterling. Freddie Gray. Tamir Rice. Michael Brown Jr. John Crawford III. Eric Garner. Susie Jackson. Juan Ramon Guerrero. Robert Adams. Dawn Hochsprung. Angela Kimata. Elodie Breuil. Nisreen Melhim. Olivier Delespesse. Brent Thompson. When I hopped on social media and had to scroll down a ways before I saw even one post about Alton Sterling, I knew something was wrong. I knew I should be heartbroken over this. Yet another senseless, horrific death. But what really struck me, and what really broke my heart, was that my first thought was "oh come on, again?". My second thought was guilt over that first one. My third thought was heartbreak over my own response. It wasn't until then that I finally felt grief. When I first started writing this, my plan was list a bunch of statistics about the mass murders, terrorist attacks, and police killings over the past few years. But instead, I'm just going to take a few moments, and then sit in silence for a while and just feel. What can I do for those who are hurting? What can I do for you, aging mother who sets the table the four, when only three people will make it through the day? What can I do for you, young gay man who missed the local Pride festival because of fear? What can I do for you, baby girl who will never know her father, because someone thought his skin was the wrong color for the office where he worked? And what can I do for you, young man, who must graduate from the police academy in memory of father, rather than celebration with father? I just sketched the image at the beginning of this post, titled Weeping Girl. I don't know when it'll become a finished piece, and honestly, I don't really want it to, because then I'll have a physical reminder of the hundreds of people who should be alive right now, but aren't. 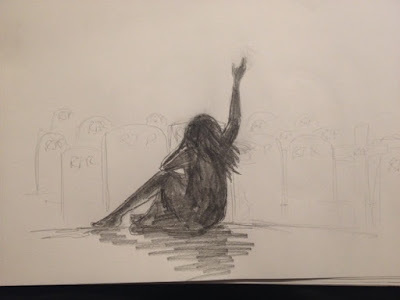 For now, this is just a simple sketch of how we all should be--crumpled on the ground, reaching out for relief from the weight of so many needless deaths. Join me in praying for Orlando, Ferguson, Paris, Brussels, Nairobi, Istanbul, New York City, Charleston, Baton Rouge, St. Paul, Dallas, and every other city where innocent people should be able to walk freely. This post has been edited in light of the 7/8/16 Dallas shooting. It's hardly right to publish a blog post grieving recent gun violence and not mention the five deaths that occurred less than twelve hours after publishing. My heart goes out to the injured and the families of all the police officers involved, as well as to the families of Alton Sterling and Philando Castile. I don't personally know your pain, but I know it's a deeper pain than anyone should have to experience.